Fitness Ring Boxing studio just love thinking outside the ring! Over the years we have created some truly memorable events. Below are some of our signature events. There is also a full gallery of slides below so you can have a look for yourself how much fun you get from staging an event at Fitness Ring or creating an event outside our facilities as we do travel and come to you too. Here are three of our tailor made programs that have started this trend, but if you have any unique and individual needs please don't hesitate to email or Call Tonia 0407 961 874. Want a wedding party, Bachelar Party or Hen's Night that packs a punch? Want to feel empowered and ready to take on the world with your new partner, your new life? Then The Fitness Ring Boxing Studio is the place to hire. This is different, fun and energetic! Learn how to be a champion, get a taste for the Fitness Ring and transform yourself into the fighting fit person you want to be to take on live the other side of tying the knot. Feel great, Feel empowered and get ready to rumble! Pound out those pre-wedding day nerves and bond with your family and friends in and an atmosphere that will leave your ready for every round to come in your life. Adidas Corporate Event getting into executive shape. From Adidas to Headspace Day and many other professional specialised corporate boot camps and once off training days, Fitness Ring have been delivering Knock Out specialised days for may corporates over the years. Whether it is half a day or a few hours of energetic fun or a whole day workshop or even a full three day event. The team at fitness ring have the experience, training and knowledge to tailor an event to inspire and motivate your staff or stage a truly memorable event. Need something fun and different to inspire your kids? Why not have a Kids Boot Camp Birthday? Combine fitness training, fun, learning how to spar, learning how to think like a champion and truly "come of age". What a fantastic way to celebrate a birthday! What a way to celebrate growing up! You bring your friends and we supply the fun, energy and of course the atmosphere of the Fitness Ring. 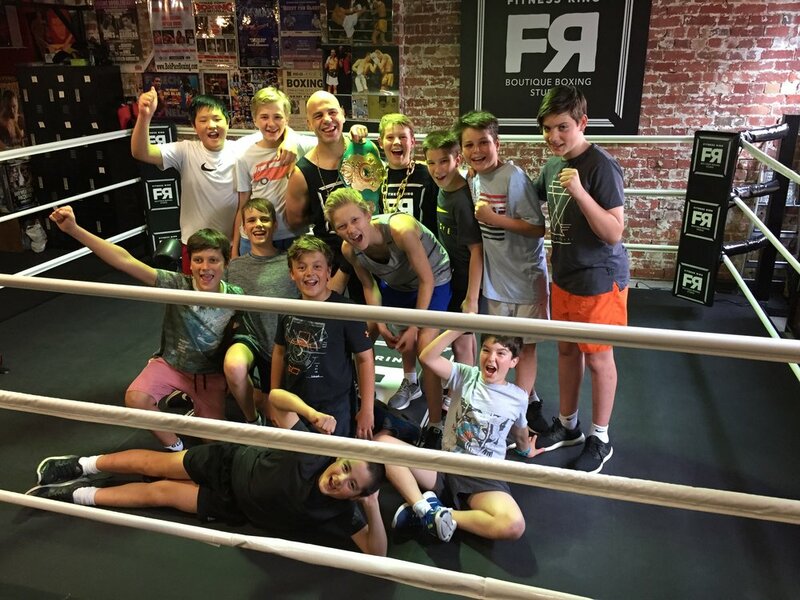 Kids can play out their fantasy of being "Rocky" or " their favour boxer like "Muhammad Ali", "Mundine", "Kostya Tszyu" or "Tyson" in the atmosphere of a real live boxing gym. Motivational and loads of fun this will be the birthday of a life time where your kids will ... move like a butterfly, sting like a bee and feel like the greatest! Thank you so much for our group session last Friday. We all had an amazing, special time! It was the perfect way to begin a corporate training day! Your design of the boxing session flowed seamlessly! How many people can say that they have individually sparred (safely!) in a ring with a world boxing champion?! [Nick] It was great in how everyone was encouraged, regardless of their boxing experience! We were all impressed with how much fun it was! Lots of laughter. Lots of energy and connecting with their colleagues. As the facilitator of the training day, I realised that beginning the workshop with such physical activity, was the most awesome way to build team relationships! When we started our afternoon leadership session, there was only positive feedback!